Quick overview Psychodynamic tackles issues central to human experience including how our relationship with our parents affects our adult relationships, why men and women are different and why we dream. 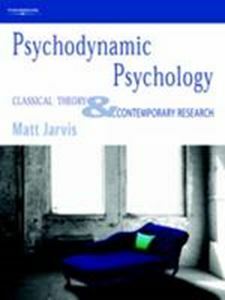 This title provides a review of the major psychodynamic theories and their practical applications. Of all the many approaches to psychology, the psychodynamic comes closest to what the layperson expects from psychology. It tackles issues central to human experience including how our relationship with our parents affects our adult relationships, why men and women are different and why we dream. The psychodynamic approach is also however the most misunderstood and misrepresented in psychology, and "Freud-bashing" has become a popular academic sport. The aim of this text is to cut through the dogma and to provide a clear and balanced review of the major psychodynamic theories and their practical applications. Beginning with a discussion of the history and current scope of the field, Jarvis sets out a reflective model for studying psychodynamics, showing how cognitive style, personal politics and biased cultural transmission inevitably colour students' perception of psychodynamic ideas. The work of some of the most important psychodynamic theorists is reviewed in detail, including that of Freud, Adler, Jung, Klein, Winnicott, Bowlby and Erikson.